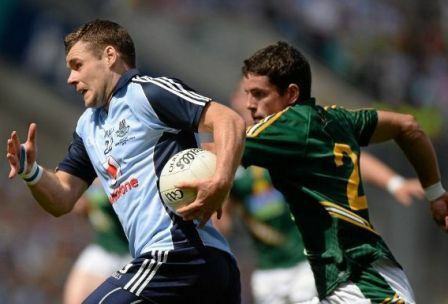 Dublin’s Kevin McManamon in possession during the Meath match. A story of a lawnmower, one that has nothing to do with the Leinster football final win for Dublin over Meath but one that was told at Croke Park on Sunday. My first Sunday off in weeks resulted in not one but two invitations to visit the GAA’s headquarters for the Leinster football final. Both were accepted. The first involved sitting down for lunch with some good men and women from Penn State and the University of Central Florida, to discuss their visit to our shores next year for a college football game. Both UCF coach George O’Leary and Penn State athletic director Dave Joyner were intrigued by their first trip to the home of the GAA and fascinated by the prospect of watching Gaelic football in the flesh. They also made for informative and entertaining lunch guests and have promised to make an impression when they bring their respective teams back to Croker next year. I’m sure they will after a short but interesting spell in their company. Soon after the final dessert spoon was put back on the table, we left the lunch suite in Croker for a corporate box in the stands on what used to be called the Canal End at this very famous ground. Liberty Insurance, a Boston company now with a large presence in the Irish market, were the hosts for the live entertainment as the Meath team I follow took on the side representing the county of my birth. We lost as it happens, but I never expected anything else to be honest. What I didn’t expect was this young Meath team to take the game to their illustrious opponents and even have the temerity to lead by two points at the halftime interval. I’ll get back to the game in a minute, but first I want to get back to the lawnmower and connect it to Sunday’s events in a very roundabout way. We had a bit of a milestone moment in our house on Sunday as our one and only daughter Lia celebrated her 18th birthday. Like all teenagers, from what I can see, she has many, many friends, and it was vital that they all party in our back garden on one of the hottest nights of this glorious Irish summer. Now kids being kids, something was bound to go astray when so many teens descended on our rural retreat down a country lane in the heart of the Royal County. And sure enough, on Sunday morning as it happens as I prepared to leave for an early throw-in at Croker, news broke that our lawnmower had vanished. It had started the night of the party sitting happily by the front gate but ended it on the missing list. Only the box that gathers the grass at the back of the mower was still present and correct, and that fact alone offered hijinks as the reason why the red machine was absent without leave. A quick scan of the lane followed with no sign of said mower. Maybe someone had robbed it properly or maybe someone had pushed it away with them as they left the party, got bored and dumped it somewhere? Only time would tell. It was a story worth telling as we sat around the lunch table in Croker, and I did just that with the consensus backing the mischief theory. And sure enough, as we settled into the halftime refreshments in the Liberty Insurance box and came to grips with the fact that Mick O’Dowd’s Meath were winning, news came through of the lawnmower’s return. Our neighbor Martin went to bed with one lawnmower parked in his garage and woke up to find two sitting there, side by side. Problem solved. Dublin had their own problems to work out as we laughed at the return of the lawnmower, and that’s when their new boss Jim Gavin proved he is up to the job. Having watched his team lose their way to Meath’s packed midfield in the first half, Gavin went like for like. Meath had stifled Stephen Cluxton’s kick-outs in the opening spell but Gavin’s half-time talk certainly did their trick. They shut down the midfield channels, hunted in packs going forward and ran Meath ragged for the second 35 minutes, no-one more so than young Ciaran Kilkenny who is, without a doubt, the finest young Gaelic football I have seen live since the Gooch Cooper was a kid in a Kerry jersey. Kilkenny was immense in that second half and Dublin were impressive as they ran up a seven-point win that neither flattered them nor belied their superiority after the resumption of activities. They may well go on to win the All-Ireland now, though I suspect Mayo or Donegal will have much more to offer as resistance in the half-back line than Meath had on Sunday. They will certainly learn from this game and that first half reversal of fortunes that wasn’t on the agenda prior to the start of the Leinster final. It all made sense in the end though and Dublin ended the day as they had started it, back on the pedestal reserved for real All-Ireland contenders in 2013 and back where they belong -- a bit like my lawnmower really. RUGBY: There are some great photos going around various Irish websites at the moment from Paul O’Connell’s stag party in Clare last weekend. The best one features the Ireland and Lions star dressed as a Scouser from the Harry Enfield TV series of the eighties complete with Alan Kennedy moustache and the authentic Liverpool football club jersey from the time. I can only assume that Paulie is a Liverpool fan. He’s certainly a Limerick hurling fan and was on site on Sunday as his county won their first Munster hurling title since 1996 for the perfect end to his stag weekend. GAA: Dublin are quite entitled to have goalkeeper Stephen Cluxton run up the pitch to take frees and 45s, but the Sunday Game analyst Kevin McStay claimed it took the ‘keeper eight minutes to take his kicks for goal in Sunday’s Leinster final win over Meath. Cluxton averaged 68 seconds per kick, but Meath’s Mickey Newman took just 43 seconds on average for his attempts at goal. Now that sounds like time-wasting to me. RUGBY: Pity poor Gavin Henson, the very talented Welsh rugby player who can’t seem to put a foot right on or off the pitch of late. Henson recently signed for English side Bath and was enjoying a night out recently when he took a knock-out blow to the chin in a bar – from one of his own players! He’s clearly made an impression in his new surroundings. HURLING: A Dublin fan of my acquaintance thinks his team is going to win the All-Ireland under Anthony Daly this year and won’t countenance the idea of Kilkenny retaining it. But the Cats proved again on Saturday, as they saw off Waterford in extra-time, that they are very much alive and kicking even if they are using up some of their nine lives. GAA: Westmeath lost the Leinster minor football final to Kildare on Sunday, but they did make history with the presence of three players of African extraction on their team. One of them was racially abused in the recent semifinal win over Meath in Navan, and that sort of behavior cannot be tolerated in the GAA. HURLING: The Limerick players allowed the TV cameras into their dressing room after Sunday’s magnificent win over Cork in the Munster hurling final and promptly entertained the nation with a stirring rendition of “Sean South of Garryowen” and their own particular take on the theme music from the Sunday Game show on RTE television. Priceless. CIARAN Kilkenny was brilliant for Dublin against Meath on Sunday, but the real story of the day developed down in Limerick where the home side ended a 17-year wait for a Munster hurling title. John Allen’s side benefited from a dubious red card decision but they fully deserved their breakthrough win. The scenes on the pitch afterwards proved how much it meant to all concerns. THERE were ugly scenes at a few GAA matches over the weekend, but none more pathetic than the sight of one mentor taking off his glasses and throwing them to a team doctor before joining in with the brawling masses at the Wexford-Longford game on Saturday night. The offender has rightly been castigated on national television here in Ireland. I only hope he realizes how stupid he looks.